With our wet weather, Portlanders look for any opportunity to spend more time outdoors. What better way to spend quality time with family and friends than in your very own outdoor kitchen? Outdoor kitchens inspire exciting outdoor living: barbeques, patio parties, pool parties, relaxing with friends and much more. They make cooking and entertaining a breeze and encourage family members and party guests to lend a hand in the cooking process. Fresh-air outdoor kichens turn any meal into a cause for celebration. The contractors at Improvement Remodeling are experts at designing and building outdoor kitchens in the Portland/Metro area. We pay close attention to the needs of our clients and do everything we can to exceed their expectations. With an outdoor kitchen from Improvement Remodeling, you get your choice of a wide variety of building materials, including: brick, stucco, granite, slate, stainless steel, stone, tile, cedar and teak. The design experts at Improvement Remodeling will customize the perfect design for your backyard space, and with expert craftmanship and quality at the forefront of every job, you're sure to be the talk of your neighborhood. Call for Guarantee & Satisfaction Details. "I recommend Edward and his crew for anything from simple handiwork to a major remodel. He gave us ideas on products that made our spaces do double and sometimes triple duty. "They did a full house remodel, including bathrooms, moving walls, finish work, and windows. They were amazing and the interactions with them were very positive." "Improvement Remodeling did a fantastic job updating our bathroom facilities. I would recommend them for anyone wanting to upgrade or remodel their facilities." “Edward was a pleasure to work with during my home remodeling experience. His eye for detail and pride in his work are second to none." 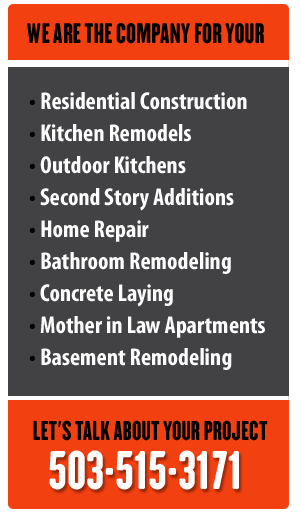 Home Remodeling Contractor Serving Portland, Beaverton, Tualatin, Hillsboro, Lake Oswego, Gresham, West Linn, and Tigard.